Curtis Granderson stole his 20th base in the first inning of today's game to became the third player in the history of the game to reach the quadruple 20 in a single season: 20 doubles, 20 triples, 20 homers and 20 stolen bases. As most of you have heard by now, the other two were Willie Mays in 1957 and Frank "Wildfire" Schulte in 1911. Their statistics for those seasons are shown in the table below. Admittedly, the 20 20 20 20 criteria are rather arbitrary and the Q20 is mostly driven by the 20 triples. Neither 20 doubles, 20 homers or 20 steals is a rare feat. Still, the Q20 is an indication of very well rounded offensive player. Willie Mays needs no introduction. He was one of the all-time greats and 1957 was not even his best season. It was a good one though as he led the league in OPS+ with 173 meaning, after adjusting for ballpark and league, his OPS was 73% above average. He also finished 4th in the MVP balloting that year. Who is Frank Schulte? He was an outfielder who played from 1904-1918 mostly for the Chicago Cubs. He was not a Hall of Famer but was a solid all around player who was an important figure in 4 National League pennants for the Cubs. 1911 was his best season as he lead the league in homers (21) and OPS+ (155) and was voted the league MVP. He also led the league with 10 home runs in 1910 and had a 137 OPS+ that year. According to The Biographical Baseball Encyclopedia, he was a daring base runner who stole home 22 times in his career. However, that's not how he got the nickname "Wildfire". He received the nickname because of his admiration for actress Lillian Russell who was in the play Wildfire. At the time of the play, she invited Schulte and some of his teammates to a party. Shortly afterwards, he named one of his horses "Wildfire" and soon enough he wound up with the same nickname himself. So, Curtis Granderson is in good company and should be congratulated for his feat. He has done much more than reach the Q20 this year. He also is among the league leaders in several other categories: 4th in runs created, 9th in OPS, 5th in slugging, 2nd in runs and 2nd in extra base hits. Yes, it is about time that this rising superstar has done something to reach the midst of the record books. Granderson has been on a streak lately and we have been winning some good games. I believe with the power and the consistency that he brings to our line up he should be considered to move down in the line up and fans will watch the RBI's just ski rocket. 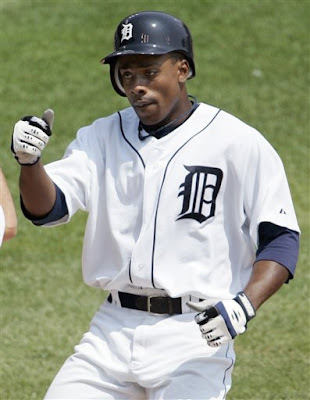 With that move the Tigers should move Timo Perez our new outfielder to the lead off spot. Timo is hitting an impressive .430 and shows no signs of slowing down. If the Tigers want to win more games tho, we have to get some focus from our starting pitching rotation we can't ride on the shoulders or Verlander all the time. Anyways Granderson hit another HR the other night putting his total at 21. He said he is pushing for the 25 mark so lets hope for the best. Go Tigers!